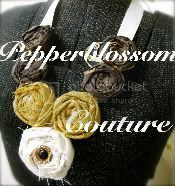 pepperblossom decor: While supplies last!! that's not going to be for very long!! I only have limited amounts of these fabrics and materials so here you go! If you want it then hurry and grab it! most are 1 of a kind and cannot be replicated. and ill send you a paypal bill or post an Etsy listing Epecially for you! And thats all for today folks!! P.s. I love Custom Orders... so don't be Shy!! And ill start doing this from time to time...sometimes with Sweet Deals!